Whether you are in office, school or on subway train or wherever you fancy a bite to eat, a sandwich is always suitable to fulfill you hunger. With so many ingredients and fillings out there, sandwiches are delicious and another convenience is that they are also easy to take on-the-go, an significant facet of today’s fast-paced modern lifestyle. However, many ingredients from the bread to the vegetables used in sandwiches can quickly lose their freshness if not packed and stored in a proper way. To make a sandwich truly stand out, it is important to pay attention to the details that go into its packaging and transport, so that the ingredients stay as fresh and delicious as they can be. My Box Printing offers personalised sandwich boxes which adheres to all your packaging needs. Lets take a look at features of our bespoke sandwich packaging boxes. 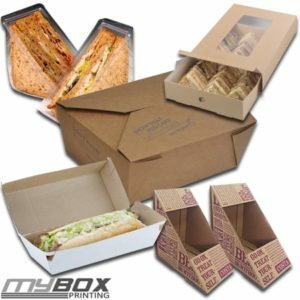 We manufacture sandwich packaging boxes in all custom shapes and sizes. So if you have a complex design or a custom size, be sure to get a product that is completely what you have desired. We use plastic or cardboard to make sandwich containers. Our materials are recyclable and biodegradable and comply with all health laws and regulations. Our state of the art production facility has modern technology equipped printing machines capable to print highest quality full colour CMYK or PMS printing on your customised sandwich packaging boxes. Our clients have the option to get their boxes finished in either matte or gloss lamination. Best thing about lamination is that they are free and has no extra costs. Our ultra-modern production facility has capacity of producing 100,000 units in one day. We understand that time is money. That’s why we expedite services to our clients. Normally withing 10-12 working days, we process an order and ship to our clients. Our products are shipped via DHL or Royal Mail and bears no extra costs to our clients. But our expedite free shipping is available only in GB, Ireland, Scotland and wales. So if you are a resident of regions not mentioned, contact our sales department with further details. Interested To Place An Order? Are you impressed with our offerings and want to give a shot at our services? Send a message to our sales department to request a quote and we will be in-touch shortly. Update: We have announced a 10% discount on our branded sandwich packaging boxes this Christmas. When you contact our sales department, make sure to avail this tremendous offer.